*When choosing a soft crab, be sure to check the softness of the outside. When a crab sloughs his shell, there is a limited amount of time that the new shell is soft and edible before it starts to become hard again (known as "paper shell"). It is important to not choose a soft shell that feels like an index card. It should be soft and pliable with no give. And ALIVE! All crabs consumed must be killed. Do not buy a dead soft shell crab. Pull the mouth of the crab down a little to make sure - it will rise back up if he is still kickin’. Meanwhile, combine the old bay and flour. Dry the crab completely using a paper towel. It will still be damp, because it was once a sea creature. Use this to your advantage by dredging it into the seasoned flour on both sides. Warm oil in skillet and pan-fry on both sides until browned and internal temperature of 150 degrees has been reached. **For a crunchier texture: combine 1 TB old bay to flour and 1 TB old may to breadcrumbs. Dredge the crab in flour, then egg, then breadcrumbs. You may need more oil to fry a soft crab this way, but you will have a flavorful crunch everyone will enjoy! Cook per the previous directions. 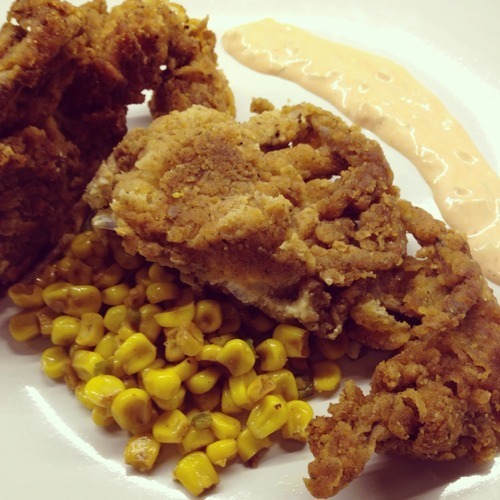 Soft shell crabs are versatile! Place one on a brioche bun with fresh spinach or bibb lettuce, tomato, and old bay mayo. Serve one "straight up" with a roasted corn and jalapeno salad and fresh tomatoes. You can even make a lemon caper sauce and serve it with your favorite starch and veggies. Pan-fried soft shell crabs should only be made fresh. If stored, will last under refrigeration no more than 1 day.